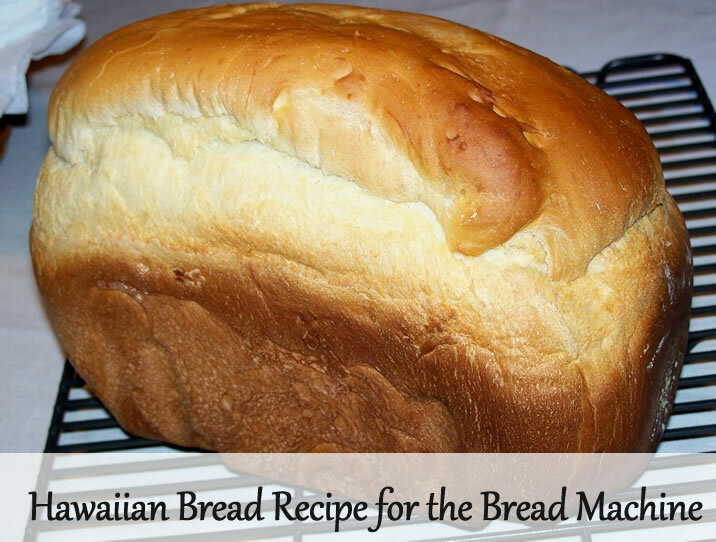 My experiment with Hawaiian bread mix made me curious about Hawaiian bread. What would it taste like if I made it from scratch? As it turns out, it tasted even better than the mix. This makes a two pound loaf. Follow the instructions that came with your bread machine in terms of which ingredients to put in the bread machine first. (My bread machine recommends adding the liquids first.) Use the basic setting. Check on the dough after five or ten minutes of kneading. It should be a smooth, round ball. If it’s too dry add liquid a tablespoon at a time until it looks OK. If it looks too wet, add flour a tablespoon at a time until it looks OK. Most of the time though, the above amounts should be just right. I made mine with the bread machine set at medium crust. It came out a little darker than I’d like. The next time I’m going to use the light crust setting. We found the crust to be extra flaky and the bread had a cake-like texture. It was great! 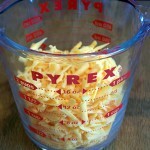 Here's the thing about my cheese bread recipe, it doesn't actually taste like cheese. BUT it is very good and you won't regret making it. It has a soft, slightly chewy texture. It's sturdy enough to use for sandwiches. Rosemary bread is lovely, firm and smells amazing while it bakes. 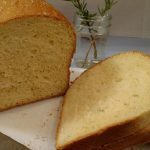 You can use dried rosemary and the bread will taste fine. However, if you have a rosemary plant I advise that you use fresh rosemary. The fresh herbs make a difference in the flavor. 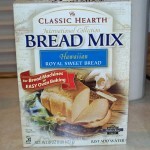 This mix gets points for ease of use and bread quality. The cost is reasonable for a mix, but more expensive than making bread from scratch. So I’m new to using my bread machine. My question is that in your instructions you say add more of an ingredient if it doesn’t look the right consistency but my machine says never to raise the lid because you have to start over. What is your take on This? That’s very interesting! What brand of machine is it? I would say that the instructions that come with your machine trump any advice that I give. So don’t raise the lid. I believe that’s meant for during the baking cycle, not the kneading cycle. This is because the temperature is regulated during baking and opening the lid can drop it. Also, steam from the baking can hit you in the face which isn’t fun. That makes sense. And by the baking cycle it’s too late to make changes anyway. I add 1 tablespoon of water. I can lift my lid without stopping the mixing process. It didn’t look like it was pulling all of the flour away from the side of the pan. The loaf was perfect. I am making a loaf today and just added the water with other liquid. Hi Joy, I’d try to get some juice. I’ve had bad experiences baking with soda. Good morning!! Will bread be okay without egg?? Thanks so much!! I’m not sure. If you try it let me know how it turns out. Good question! I would not make this with recipe with gluten free flour. GF flour is a lot different than bread flour and the recipe would need a lot of tinkering in order for it to work. Do you use the white bread setting or the sweet setting? My Zojirushi doesn’t have a sweet setting. I just used the basic setting. Booklet for BBCC-Q10 is damaged. Where can I get another booklet? My Zojirushi machine (the new model that just came out) doesn’t have a basic setting. Do you know what the equivalent would be? Hi Jane, I think the “white” setting would be best for your machine. What’s the difference between bread flour and regular flour? Great question! This blog post explains it. I’m allergic to pineapple, but I love Hawaiian bread. Is there a good substitute for the pineapple juice? I’ve never tried it but maybe orange juice? Is the 2 Tablespoons of milk called for in the recipe dry milk powder? It is listed with the dry ingredients so it made me wonder. Thanks. Thanks for asking! It’s liquid milk. I’ve changed the order of the ingredients to make that more clear. I don’t have a Sunbeam, but on my Zo the machine will reset if I unplug it for 15 minutes or so. I would like to try this recipe. One challenge I have is making it low sodium / no sodium. Can this recipe be tweaked to make it low sodium or remove the salt all together? I’m sorry, but I don’t have a low sodium version of this recipe. I don’t recommend removing the salt either as that would cause the bread to rise way too much. Can I add pieces of pinapple? You can try it and see if it works. I’d start with half a cup. 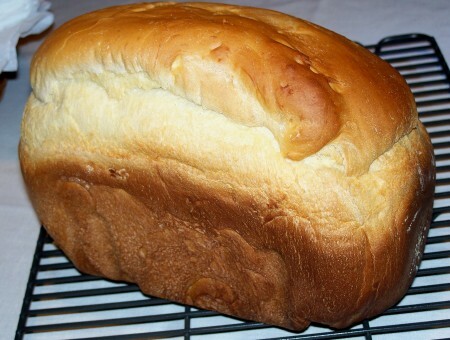 I havea one and a half bread machine how can I adjust to make this recipe. My son loves hawaiian bread. Hi Leslie, Here’s a page tells you how to convert the recipe for differently sized machines.